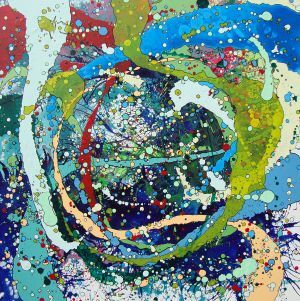 My paintings are founded upon an ongoing investigation into transforming the modern abstract expressionist mark into the postmodern vocabulary. 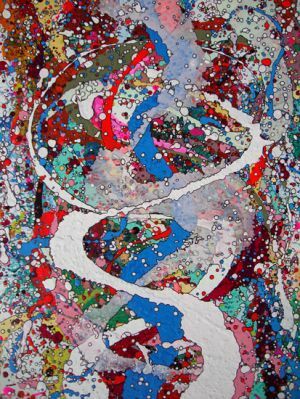 In my current paintings, I use the pour and drip as a trope by changing them into a language influenced by graphic design, pop art, virtual reality and animation. They become a hybridization of these elements. It is my intention to incorporate the random and arbitrary through controlled accidents. I expand on Jackson Pollock’s chance driven splatter method by harnessing the chaos of spilled paint and drips and creating order with the careful deliberate movement of a blow dryer. My process continues with a degree of almost mindless repetition of outlining while creating layers and interactions between each element. The marks I create turn into fragmented, animated personalities that uninhibitedly converse, move or quite simply play with one another. Often taking my palette directly from pre-determined sources such as Dr. Seuss books, psychedelic posters, the computer and cyberspace, I blur the line between the physical and virtual. Kristine Schomaker (aka Gracie Kendal) is a new media/performance artist and a painter living in Southern California. She received her MA in Art from California State University, Northridge. During the past 12 years, her practice has focused on experimenting with various interdisciplinary art forms. 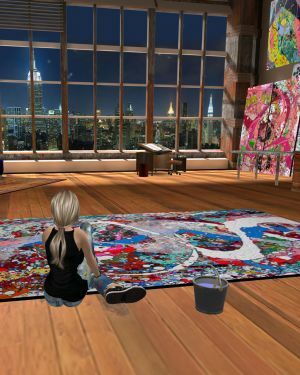 She is now exploring her own identity through work in the web 2.0 virtual world of Second Life. Her current project is titled My Life As An Avatar and can be seen on her blog at www.graciekendal.wordpress.com. 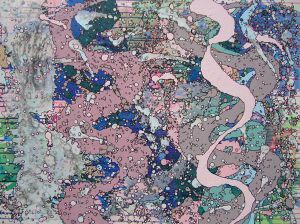 Schomaker is also an art historian with a concentration in modern and contemporary art. She teaches at Pasadena City College.